CEDAR SHAKE CEDAR SHINGLE WHY CHOOSE A CEDAR SHAKE OR CEDAR SHINGLE ROOF? Wood Shakes CEDAR SHAKE CEDAR SHINGLE If you’d like to learn more, or to see how we can make it work best for you, contact the cedar experts at Direct Cedar and Roofing Supplies by email at sales@directcedarsupplies.com. You can also call us locally at 604-850-1767, or toll-free at 1-877-850-1767. Installing a new roof can be an expensive affair. You want the structure to provide value for money and last for a very long time. The strength and durability of the roof depends on the quality of roofing materials, which is why you need to research your options and consider the advantages of the material carefully. Here are some reasons why cedar shake or shingle is a good option for you: 1. Resilient Cedar is one of the most naturally resilient building materials in the world and if it’s maintained well, it can last for decades. Cedar has a number of natural chemical properties that make it resistant to moisture, moss, insects and pests, and the sun’s UV rays. The shingles and shakes are also treated with special agents and solutions to make them fire resistant and protect them from fungus. All of these characteristics make cedar very durable. 2. Against all weather Cedar shakes and shingles have the natural ability to tolerate all kinds of weather conditions without experiencing much damage or wear. This roofing material can bear all kinds of weather conditions and that includes snow, rain, storm, and even hail. 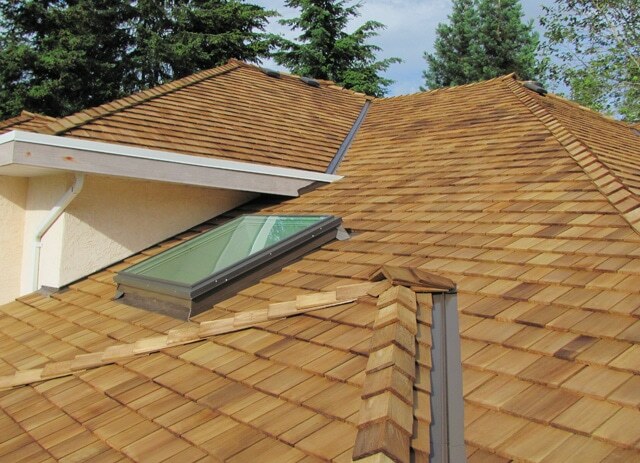 Cedar shingles are known to recover from the impact of hail and develop an even surface once again. If you maintain the shingles well and make sure they’re sealed, you shouldn't face any problems due to extreme weather conditions. 3. Insulation Cedar can help you save some money on your energy bills in the long run because it’s one of the best insulators available today. It will limit the transfer of heat or cold into your property and that means your HVAC system will consume less energy to maintain a comfortable indoor environment. These savings can justify the slightly higher initial investment. 4. Durability Cedar roofs are very durable and once you install them, you won’t need to replace them for over 20 to 40 years. If you maintain the roof well, you might even be able to extend the life of the shingles. This saves money and effort in the long run because you won’t have to replace your roof as often. 5. Property value Most prospective home buyers will be impressed by the cedar roof’s distinctive appearance and quality so they’ll be willing to pay more in order to purchase it. Cedarroofs increase the property value by a considerable margin so you’ll recover most of what you spent on installation. 6. Beauty Cedar roofs look very beautiful and add a distinctive design element to your property. There are a number of color and texture options for you to choose from so you’re sure to find something that fits into the overall design of your property. If you’d like to learn more, or to see how we can make it work best for you, contact the cedar experts at Direct Cedar and Roofing Supplies by email at sales@directcedarsupplies.com. You can also call us locally at 604-850-1767, or toll-free at 1-877-850-1767.